- Strawberry wipes and more. .
We have gained a remarkable position in the market that is involved in offering Surgical Tray. With Novel’s Make-Up Remover Wipes, you can remove all traces of make-up from your face, neck and eyes with relative ease and comfort. 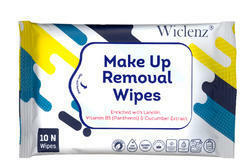 The special formula in these wipes cleanses your skin with a gentle toning action, removing all traces of make-up. Soft cloth enriched with a special substance containing ions of magnesium, zinc and copper stimulating skin functions and regeneration. Used for removing of make- up of face, neck and neckline. Alcohol free. Dermatologically tested. - Silky soft, gentle & extra absorbent disposable cosmetic wet wipes can be used as 3 in 1- complete cleansing and skin care wipes. - Helps in cleansing, toning and hydrating your skin, leaving it radiant and glowing.